The National Weather Service In Shreveport Has Issued A * Flash Flood Warning For... Central Smith County In Northeastern Texas... * Until 930 Pm Cdt. * At 734 Pm Cdt, Doppler Radar Indicated Thunderstorms Producing Heavy Rain Across The Warned Area. Up To Two To Three Inches Of ...Read More. ...the Flash Flood Warning Remains In Effect Until 815 Pm Cdt For Southeastern Bee County... At 727 Pm Cdt, Trained Weather Spotters Reported Thunderstorms Producing Heavy Rain In Southeast Bee County. Flash Flooding Will Slowly End As The Storms Move East Of The Area. Some Locations That Will Experience Flooding Include... ...Read More. 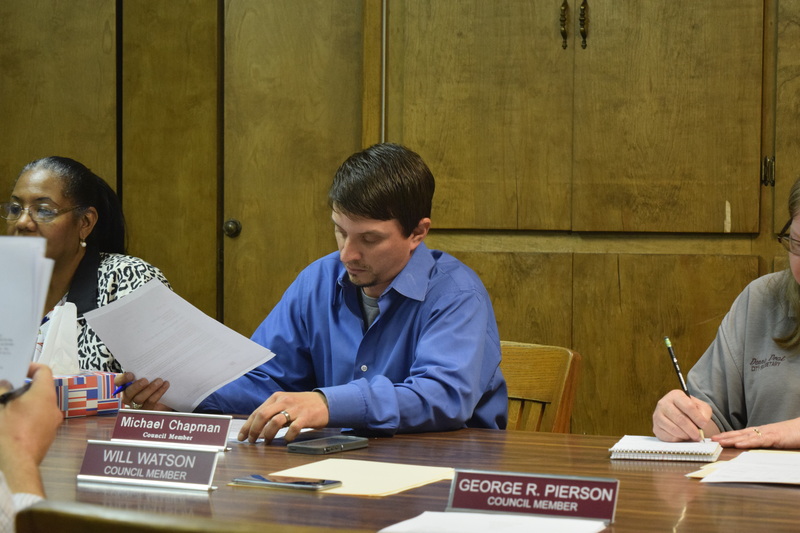 GRAPELAND – The Grapeland City Council met in a called meeting on Tuesday, May 23 to take care of a few items which had been postponed from a previous council meeting held on May 16. Near the end of the meeting, the council was asked to select a sitting councilmember to serve as the city’s mayor pro tem. The mayor pro tem performs mayoral duties in the event of the mayor’s absence or incapacity, however, the mayor pro tem retains the right to vote on all matters brought before the city council while he or she fills in for the mayor. After the ballots were cast and the votes were counted, Councilman Michael Chapman was elected as the City of Grapeland’s Mayor Pro Tem. Prior to Chapman’s selection as mayor pro tem, the first agenda item concerned the awarding of bids for roof work on a city-owned property (the former Grapeland Nursing Home) at 205 Church St.
Grapeland Mayor Balis Dailey informed the council all the bids received by the city came from qualified bidders and indicated the lowest bid came from S and S roofing in Pittsburg, Texas. “There will be a 90-day period, which will begin as of this evening, to get the project complete,” Dailey said. The bid was unanimously accepted. Following the bid discussion, Dailey reported the city had received a request from the Grapeland Chamber of Commerce to hold a garage sale on Main Street. The event is scheduled for June 3 and Dailey asserted FM 227 would not be closed for the event. He did indicate, however, some of the side streets would be closed. A motion was made, seconded and unanimously approved to allow the chamber to host the garage sale. Before the council session concluded, Dailey reminded the councilmembers of the upcoming budget workshops scheduled for May 30, June 6 and June 15. The meetings are scheduled to begin at 6 p.m. and are open to the public. With no further business, the meeting was adjourned at 6:45 p.m. Previous articlePart One: Simply the Best!